Barack Obama said Burma is on a “remarkable journey” of reform that has much further to go, on his first visit to the South East Asian nation by a serving US president. A desire for change had been met by an agenda of reform, he said, and he was there to extend a “hand of friendship”. But, in a speech at Rangoon University, Barack Obama urged Burmese people to accept Muslim Rohingyas after recent violence. Crowds of people, some waving US flags, lined the streets as he arrived. The visit was intended to show support for the reforms put in place by Thein Sein’s government since the end of military rule in November 2010. Activists have warned that the visit may be too hasty – political prisoners remain behind bars and ethnic conflicts in border areas are unresolved. On Monday another prisoner amnesty was announced, with about 50 of the 66 inmates freed reportedly political detainees. About 200 political prisoners remain behind bars, activists say. Barack Obama spent about six hours in Burma and did not visit the capital, Nay Pyi Taw. The highlight of his visit was a speech at Rangoon University, which was at the heart of pro-democracy protests in 1988 that were violently suppressed by the military regime. Addressing students, he said America would help to rebuild Burma’s economy and could be a partner on its journey forward. Referring to his 20 January 2009 inauguration speech in which he pledged the US would extend a hand to any country that was willing to unclench its fist, he said: “Today I’ve come to keep my promise and extend the hand of friendship. “But this remarkable journey has just begun, and has much further to go. He called for an end to communal violence between Muslims and Buddhists in the western state of Rakhine that has left more than 100,000 people displaced. They are mostly Muslim Rohingyas who are stateless and face severe discrimination in Burma. “National reconciliation will take time, but for the sake of our common humanity, and for the sake of this country’s future, it is necessary to stop the incitement and to stop violence,” he said. Earlier Barack Obama met Thein Sein, saying the reform process “here in Myanmar… is one that can lead to incredible development opportunities”. He used the country name preferred by the government – US officials described the move as a “diplomatic courtesy” but not a policy shift. 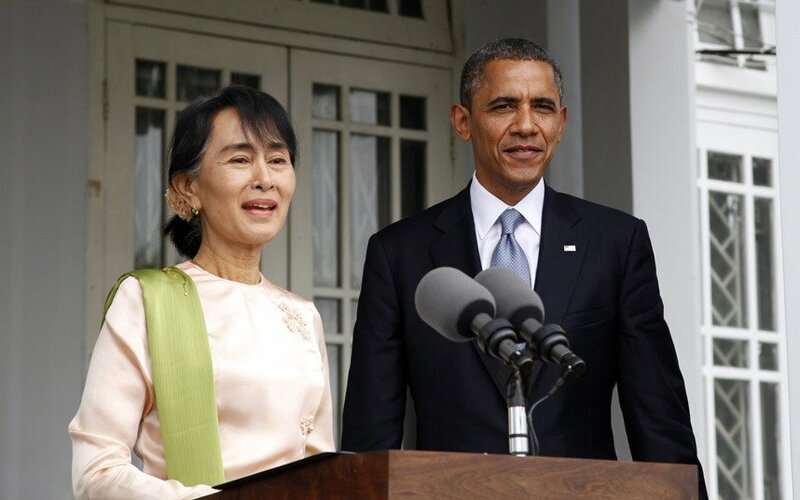 Barack Obama then met pro-democracy leader Aung San Suu Kyi at the lakeside home where she spent years under house arrest. She thanked the US for its support but warned that difficult times could lie ahead. “The most difficult time in any transition is when we think that success is in sight,” she said, saying people should not be “lured by a mirage of success”. The US president and his team also made a brief stop at Shwedagon Pagoda, the Rangoon landmark that has been at the heart of many key moments in the country’s history. Barack Obama was accompanied by Secretary of State Hillary Clinton – who was returning to Burma almost a year after her first visit. Thein Sein’s government came to power after widely criticized polls in November 2010 that saw military rule replaced with a military-backed civilian government. Since then – to the surprise of many – his administration has embarked on a reform process. Many – but not all – political prisoners have been freed, censorship has been relaxed and some economic reforms enacted. Aung San Suu Kyi was freed from house arrest shortly after the polls. Her NLD party, which boycotted the elections, has since rejoined the political process. It now has a small presence in parliament after a landslide win in by-elections deemed generally free and fair in April. In response to the reforms, many Western nations have relaxed sanctions against Burma and begun a process of engagement. But rights groups have cautioned against a rush to embrace the South East Asian nation, warning that political prisoners remain behind bars and ethnic conflicts are unresolved. After visiting Burma, Barack Obama headed to Cambodia to join a meeting of the Association of South East Asian Nations, in a trip that underlines the shift in US foreign policy focus to the Asia-Pacific region.